GravityExamples.com is dedicated to providing the largest selection of premade Gravity Forms templates and example forms on the web. My name is Paul Drecksler and I have developed hundreds of WordPress websites. Ever since I discovered Gravity Forms a few years ago, I've used the Gravity Forms plugin on almost every WordPress website I've created. In my humble opinion, I feel that Gravity Forms is the best WordPress form plugin available on the market today. Gravity Forms is easy to use and integrates with most major SAAS companies and e-commerce solutions, which makes my job as a developer a little easier and a lot less time consuming. One thing I've always wished is that there was a place online to find premade Gravity Forms that I could download, customize, and use on my sites. Although Gravity Forms is already very easy to use, the ability to start with a premade form that almost suits my needs and then edit and customize it (as opposed to starting from scratch each time) would speed up my process of creating new Gravity Forms. Since this did not exist, I decided to create it. 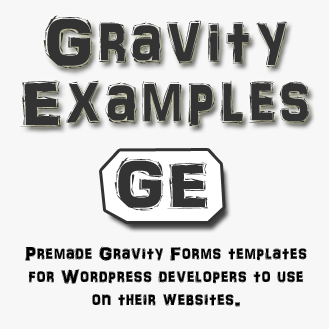 My goal is for GravityExamples.com to become an incredible resource for WordPress developers everywhere with the largest selection of premade Gravity Forms templates and example forms on the web..
1. Browse our Gravity Forms Examples. Here you can download premade Gravity Forms, Import the files into your website via the plugin interface, and then edit and publish the forms on your website. 2. If you don't already own a copy, here is a link to download Gravity Forms plugin for WordPress. 3. Developers, please help grow our database of Gravity Examples Forms by submitting a form that you've created. Please share this website so that other WordPress developers may benefit from our library of premade Gravity Forms Examples.